„Only one more hill to go “those words felt like music to my ears as I glanced worryingly up a very steep and rugged hill. There had been a few of those and despite the wonderful views, the 23km long Dyrfjallahlaup mountain race was starting to take its toll on me. But still it had been a glorious day, and the best was yet to come. On the morning of the race the sun was shining and it was the warmest day we can remember ever having in a race in Iceland. The start line of the race was near a farm 10 minutes’ drive outside the village of Borgarfjörður eystri. The first 6km were uphill on an old gravel road but then the course took a turn off the road and went below the mountain ridge of the mountain Dyrfjöll, still continuing uphill. Borgarfjörður eystri in the northeast of Iceland is not among the most visited places in Iceland. It is 715 km from Reykjavik and a little off the beaten track as most people go to see the Blue Lagoon and do the Golden Circle. But if you want to escape the crowds and experience wild and unspoiled Iceland this place is one you should visit. Borgarfjörður is a great base for hiking in the East Fjords, with many marked trails and hiking maps available. Less than a 100 people live in this beautiful village during the winter but they still have many nice guesthouses, an excellent campsite, restaurants and so much to see and do. Borgarfjörður is also said to be the home of the Queen of Elves. After having a delicious fish soup at a local restaurant on our first night we went to see the puffins that can be found only 5 minutes’ drive from the village – there are not many places in the country or in Europe where they are so accessible. Halfway through the race we reached the amazing Stórurð (Big Rocks), a natural wonder that isn’t very well known even among Icelanders. The beauty of the trail is unreal, alpine lakes scattered among huge rock formations just below some of the most spectacular mountains in the country. We found the race more difficult than we had anticipated and I was soon regretting not having prepared more seriously! The trail is not always clear and the terrain often difficult to run in, but the scenery is so breathtakingly beautiful that it hardly mattered. Thankfully the race and aid station staff were very encouraging and cheerful. „You look good“ someone said when I arrived with a small group of fellow runners at the aid station just after the top of the last hill. We knew of course that it wasn’t true, but we were far past the point of caring about how we looked. There were three aid stations, and quite a few creeks and rivers that we crossed and drank from along the way. Crossing the rivers felt so refreshing and energizing in the unusual Icelandic heat. The last few kilometres of the race are down a grassy slope from where the very welcome sight of the Borgarfjörður village comes into view and the finish line as it gets closer with every step. At the finish we were handed medals and a beer glass and there was a huge fish tub full of cold drinks waiting for us, including Mikkeller beers called „Running“. We sat in the grass for hours in the sunshine with old and new friends before heading to our guesthouse and the spa for a well earned hot tub and a cold bath. In the evening we headed for a buffet at the local community hall and a concert later that night where we had a great time. On our last day the sun was still shining. We packed up our things but decided we couldn’t leave without having a better look at the Stórurð. Fortunately we didn‘t have to walk the same way as during the race but it was still in total a 15km hike from the main road and back. It was more than worth it, and clearly we were not the only runners who had that idea because it seemed like we met half of the runners from the Dyrfjallahlaup race. After three wonderful days in Borgarfjordur we finally had to leave. We look forward to coming back next year. Here is a video from the Stórurð area. 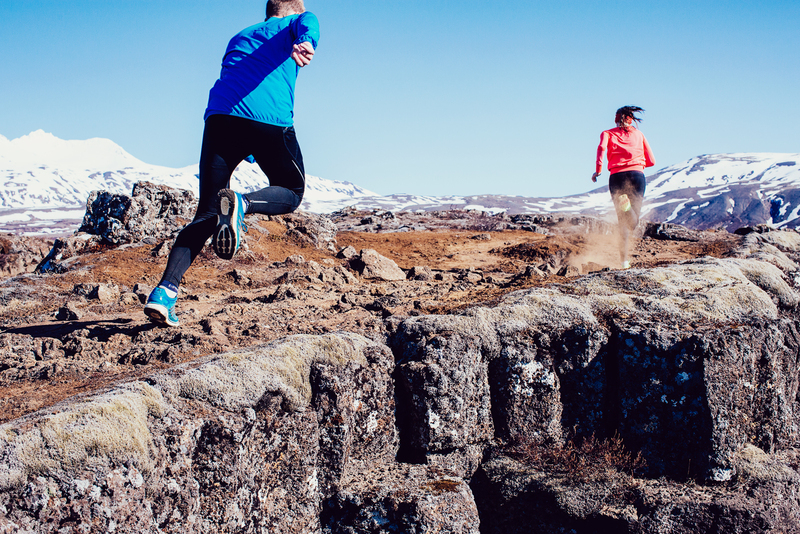 Photos: Dyrfjallahlaup (Andri Geir Elvarsson, Helga Björg, Torfi Bergsson) and Running in Iceland. Pingback: Þetta hundalíf – Sögustundin – í frásögur færandi! What date will this race be held on in 2018? Thank you! We don’t know yet, but expect to meet the organizer at another race this weekend, we will ask her!